My Little Pony is one of the biggest 80s reboots. It has quickly become a pop culture phenomenon, spawning a hit cartoon, toy line and dozens of other products. 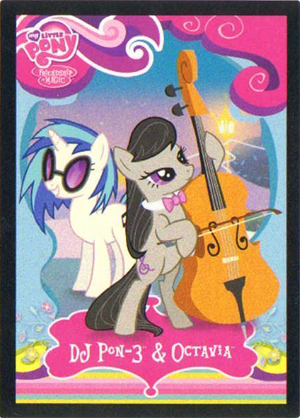 Following the same pattern are the 2012 Enterplay My Little Pony Friendship is Magic trading cards. The initial launch quickly sold through, which led to a product back order. The set has an 84-card base set that is divided into several subsets. 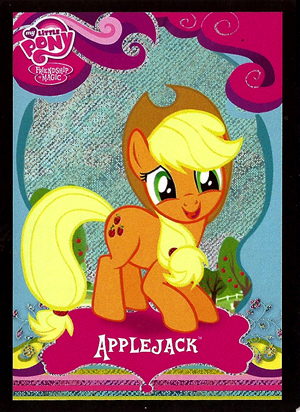 Besides character cards for the ponies, their pets and enemies, there are highlights from the cartoon and location cards. These location cards, which fall one per pack, double as an online sweepstakes. All cards come with rounded corners, similar to playing cards. Base cards also have a thin black border. Every pack also has two insert cards. 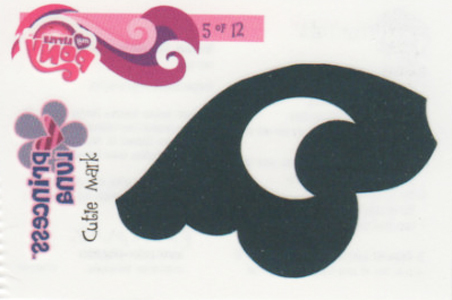 Twelve FunTats (1 per pack) are mini tattoo sheets, most of which have Cutie Marks, the icons on the side of each pony's back. Every pack also has either a Pop-Up Standee or a Foil card. Basic foil cards have several subsets and puzzle themes, but all are numbered together. There are also four rare Gold Series cards and four Gold Series Box Toppers. An album that is sold separately comes with an exclusive six-card foil puzzle. 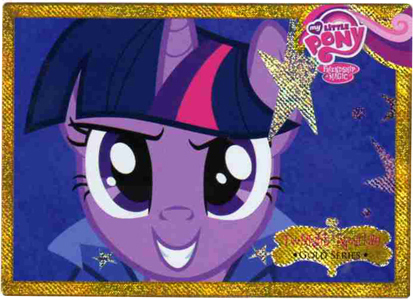 The most popular 2012 Enterplay My Little Pony Friendship is Magic cards are a pair of Foil cards available only at shows. F40 was given out at the 2012 Brony Con in New Jersey. On the secondary market, they have been consistently selling for more than $150. F37 was first given out at the 2012 San Diego Comic Con but Enterplay said it would also be offered at other shows. That hasn't stopped the promo card from soaring, with one surpassing $400. 36 The Great and Powerful Trixie! 47 A Party of One? 48 "Come on and Smile!" 49 "Chaos is a wonderful thing." 54 "You're not scientifically possible!" 55 "My little Spikey Wikey!" 59 Meet the Apple Family! 61 "Hush Now Quiet Now"
64 "I hate being a model." 72 "I really AM a doormat." 34 cards. Inserted 1:2 packs. F29 Twilight Sparkle in Chaos! F30 Pinkie Pie in Chaos! 12 cards. Each is a small sheet of tattoos featuring pony Beauty Marks. Four cards. Numbering continues from pack-inserted Gold Series cards. Inserted 1:2 packs. Nine cards. Available only at select shows and conventions. 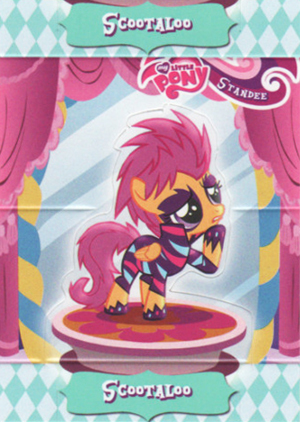 EMPTY ALBUM MY LITTLE PONY REYAUCA VENEZUELA + (200) UNOPENED PACK VERY RARE.